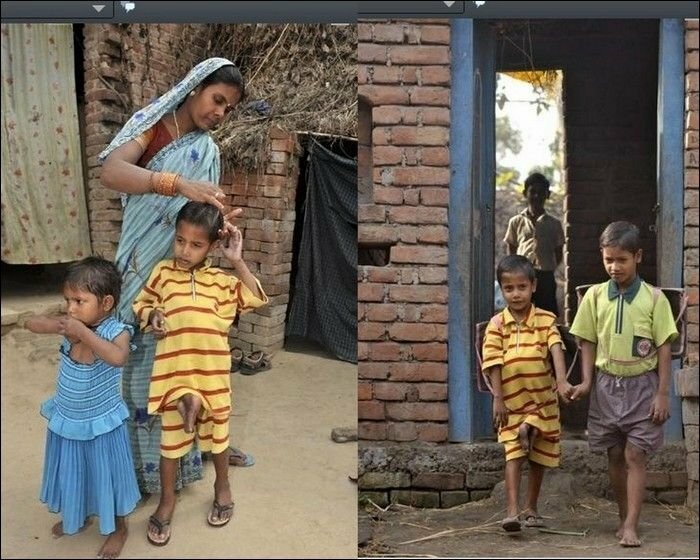 Eight-year-old Indian boy Deepak Kumar Paswaan was born with body parts of his twin attached to the chest. The locals call him Octopus-boy and some people think that he is the devil in a human body. Fortunately for him, his parents and volunteers have collected enough money for the surgery and the parasitic twin was removed. A parasitic twin (also known as an asymmetrical or unequal conjoined twin) is the result of the processes that produce vanishing twins and conjoined twins, and may represent a continuum between the two. Parasitic twins occur when a twin embryo begins developing in utero, but the pair does not fully separate, and one embryo maintains dominant development at the expense of the other. Unlike conjoined twins, one ceases development during gestation and is vestigial to a mostly fully formed, otherwise healthy individual twin. The undeveloped twin is defined as parasitic, rather than conjoined, because it is incompletely formed or wholly dependent on the body functions of the complete fetus. The independent twin is called the autosite.